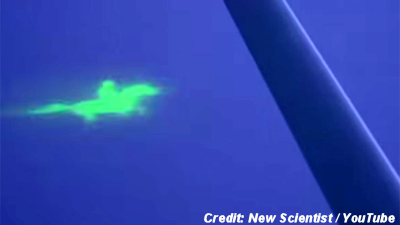 A green ghost rider appeared in the sky over the British city of Nottingham when scientists started testing a newly developed projecting device which allows the beaming of moving images directly onto clouds for the first time ever. The image of a galloping horse rider was projected onto the clouds from a distance of 50 meters by a special laser-based projection system mounted on an aircraft. The system beaming the images into the clouds was invented by a research team, calling itself Project Nimbus. It is composed of a designer, Dave Lynch, and a chemist, Dr Mike Nix, from the University of Leeds, who ultimately want to be able to beam the movies onto the clouds from the ground. The video of the galloping horse-rider is a result of a five year long research project. . . .